The finalists for the 2019 Hugo Awards, Lodestar Award for Best Young Adult Book, and John W. Campbell Award for Best New Writer and for the 1944 Retrospective Hugo Awards were announced online today by Dublin 2019. There were 1800 valid nominating ballots (1797 electronic and 3 paper) received and counted from the members of the 2018 and 2019 World Science Fiction Conventions for the 2019 Hugo Awards. For the 1944 Retro Hugo Awards, 217 valid nominating ballots (214 electronic and 3 paper) were received. Dublin 2019 has announced that they will be revealing the finalists for the 2019 Hugo Awards, and the 1944 Retro Hugo Awards, today. You will be able to follow events live as they happen from 14:00 (Irish time) on the convention’s YouTube channel. We expect to have the full lists online here befor 15:00 (Irish time). For those of you around the world, Ireland is currently in the same time zone as the UK, an hour behind Paris, 2 hours behind Helsinki, 5 hours ahead of Boston, 8 hours ahead of San Francisco, 7 hours behind Beijing, 10 hours behind Melbourne and 12 hours behind Wellington. Nominations for the 2019 Hugo/Best YA Book/John W. Campbell Award and for the 1944 Retrospective Hugo Awards have closed. The Administrators are tallying the nominations, confirming potential finalists’ eligibility, and contacting potential finalists in accordance with World Science Fiction Society rules. Details of Dublin 2019’s plans to reveal the finalists will be announced soon. The nominating period for the 2019 Hugo Awards and 1944 Retrospective Hugo Awards is now open, according to an announcement from Dublin 2019. The convention also announced the designers for the various award bases. The 2019 Hugo Award base will be designed by Jim Fitzpatrick; that for the 1944 Retro Hugo Awards will be designed by Dr Eleanor Wheeler; and the trophy for the new Lodestar Award for Young Adult Fiction will be designed by Sara Felix. Instructions for accessing the online nominating form have been sent via e-mail. Check your junk e-mail/spam/promotions folders in your e-mail client for this e-mail if you did not receive it. Despite the convention’s efforts, voter information notification messages may be flagged as spam. The Dublin 2019 Hugo Awards web page has the links to the online nominating ballots for the 2019 and 1944 Hugo Awards. Dublin 2019 is not using a voting PIN system. Your email from the convention will contain a unique URL that provides access to your ballot. Paper ballots will be mailed to those members of Dublin 2109 who requested paper publications along with the convention’s Progress Report 3, currently in production. PDFs of the paper ballots are also available from Worldcon 76’s Hugo Awards page. Dublin 2019 will be presenting the 2019 Hugo Awards (generally for works first published or appearing in 2018) as well as the 1944 Retrospective Hugo Awards (generally for works first published or appearing in 1943). Any person who was a voting member of at least one of the 2018 or 2019 World Science Fiction Conventions as of December 31, 2018 may cast nominating ballots for the 2019 and 1944 Awards. If you are a member of the 2018 Worldcon but not the 2019 Worldcon and did not give the 2018 Worldcon (San José) permission to share your information with the 2019 Worldcon (Dublin), the 2019 Worldcon will not contact you, due to data-privacy rules. If you are a member of the 2018 Worldcon and did not receive an e-mail from the 2019 Worldcon but want to nominate, contact the Dublin 2019 Hugo Award Administrators. Included in the ballots will be voting for a Special Hugo Award of Best Art Book. Each Worldcon has the right to add one category to the Hugo Awards for their year only, and Dublin 2019 has elected to use this power to test an Art Book category. The ballots will also include voting on two other awards administered by the World Science Fiction Society. These are the WSFS Lodestar Award for Young Adult Fiction; and the John W. Campbell Award for Best New Writer presented by Dell Magazines. Please direct any questions about the administration of the 2019 and 1944 Hugo Awards to the Dublin 2019 Hugo Award Administrators, not to the Hugo Awards web site. The Hugo Awards web site team does not administer the elections for the Hugo Awards, nor do we make eligibility rulings. The 2019/1944 Hugo Awards are administered by the Hugo Awards Administration Subcommittee of Dublin 2019, and all decisions regarding the eligibility of works and the administration of nominations are exclusively the committee’s responsibility. To join the 2019 Worldcon, go to the Dublin 2019 Membership Page. You do not have to attend Dublin to be a member. A supporting membership includes all of the membership rights including nominating for the Hugo Awards, but not the right to attend the convention itself. The other membership classes including Attending and Young Adult can attend the convention and also have the nominating and voting rights. If you join Dublin as at least a supporting member by the end of 2018, you will be eligible to nominate for the 2019 Hugo Awards. The final ballot will be announced sometime after nominations close. Only members of the 2019 Worldcon will be eligible to vote on the final ballot. The deadline for joining in order to vote on the final ballot is when final ballot voting closes. Dublin 2019 has not yet announced specific dates. The December 31, 2018 deadline applies only to joining in order to nominate, not to vote on the final ballot. 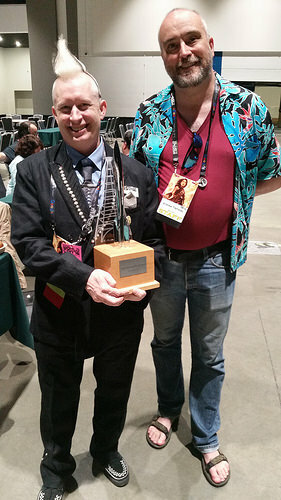 The 2019 Hugo Awards will be administered by the 2019 Worldcon. See the 2019 Hugo Awards web page on the 2019 Worldcon’s web site for additional information. Address specific questions about the 2019 Hugo Awards to the 2019 Worldcon. The Hugo Awards web site does not run the Hugo Awards. Each year’s Awards are run by that year’s Worldcon. In general, the 2019 Hugo Awards (and the 1944 Retrospective Hugo Awards, also being run by the 2019 Worldcon) are for work first published in the previous year. Therefore the 2019 Hugo Awards are for works first published in 2018 and the 1944 Retro-Hugo Awards are for works first published in 1943. There are exceptions for works previously published in languages other than English, and for works originally published outside of the USA. See the section about “Year of Eligibility” on the Hugo Award Categories page for a longer discussion of this. Here are the results of the 2018 Hugo awards. Congratulations to all of the winners. The full voting and nomination breakdowns are available here. Looking for the livestream of the 2018 Hugo Awards? Click here! 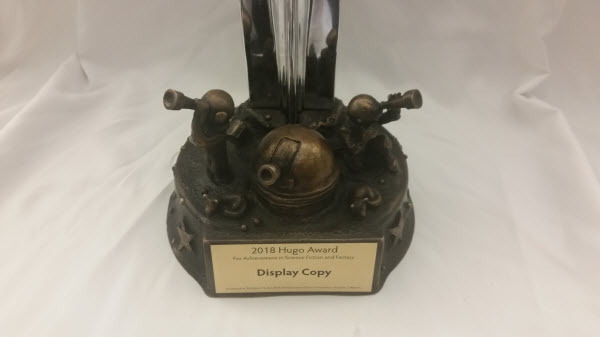 Coverage of the 2018 Hugo Awards Ceremony on TheHugoAwards.org is made possible in part by a grant from the Utah Fandom Organization and Westercon 72, July 4-7, 2019 in Layton, Utah. This is where you can find the live video coverage of tonight’s ceremony. 8 hours to go! 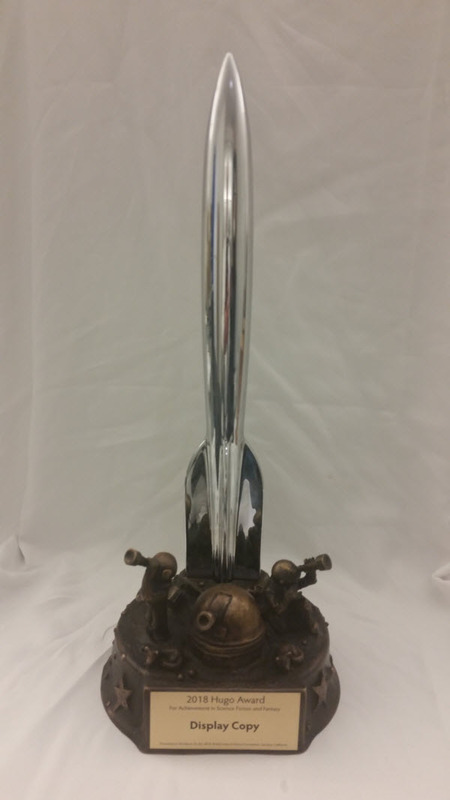 The trophy for this year’s Hugo Awards was unveiled as part of the Worldcon 76 opening ceremonies. The base design is by Sara Felix and Vincent Villafranca. Here’s a close-up of the base. This year’s Hugo Award winners will be announced on Sunday night (California time). For details of our live coverage see here. This photograph of Worldcon 76 Chair, Kevin Roche, pictured with his husband, Andy Trembley, gives a much better view of the tower behind the rocket. The design is based on the San José Electric Light Tower. The base of the trophy is made from cherry wood because cherries were a major crop in San José before the advent of Silicon Valley.